Your own photography is never enough. Every photographer who has lasted has depended on other people’s pictures too – photographs that may be public or private, serious or funny, but that carry with them a reminder of community. If I like many photographer, and I do, I account for this by noting a quality they share – animation. 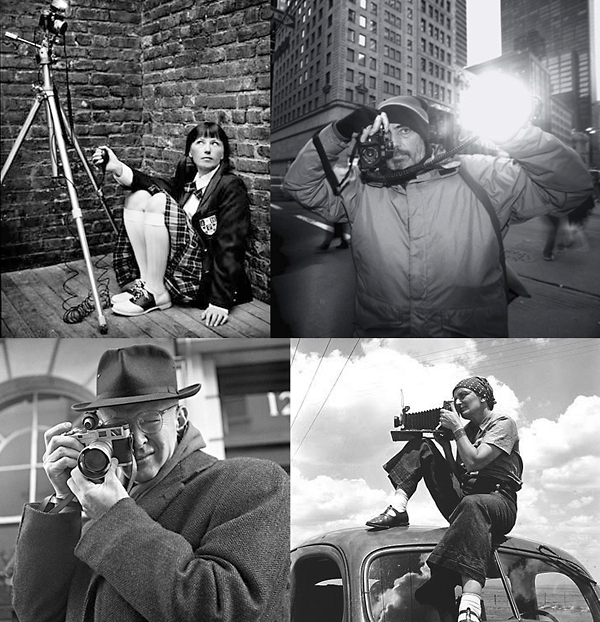 They may or may not make a living by photography, but they are alive by it. This sense of a photographic community is vital and imperative to continued development and nurturing of both a photographers’ vision as well as photography itself. I would propose students of photography embrace it all, the photoblogs, Flickr, websites, galleries, museums, as well as fellow photographers engaged with the medium in a manner similar to your own aspirations, including conceptual concerns, aesthetic approaches and thoughts on the possibilities of photography. Introduce the photographer, including the photographer’s name, the title of the work, the date, processes used, and any other appropriate background information. Discuss the photographers work in general as well as mention significant aspects of the historical and cultural context in which the photographer worked. Discuss important technical aspects, such as equipment and/or processes used, that contribute to an understanding of the photographer from a descriptive and interpretive context. What is photographed, genre of photography, the circumstances in which the photograph was made and the particular details that inform the nature of the thing itself (keep in mind that the thing itself and the subject matter are two different considerations). Aesthetic considerations (use of frame | compositional balance | use of line, shapes, volume | description of texture) | vantage point and point of view | moment of exposure). Visual considerations (color, grayscale (black and white) and/or an alternative visual sensibility such as a collage or montage | light or dark | flat or contrasty). Use of light (type of lighting | quality of lighting). Discuss what concerns, ideas, and/or curiosities the photographers work reveals, suggests and/or implies to you, including emotional, psychological, historical, sociological, cultural implications and considerations, so as to begin to understand its meaning. What are the photographs about? What do they represent or express? Within what tradition / movement do they belong? Are there references that inform how the photographs were made and what they are about? How has psychological, historical, sociological and/or cultural contexts shaped their creation and your reading of the photographs? Does it reinforce or disrupt preconceptions? What is satisfying and dissatisfying about the photographers work? Are there moral, ethical, gender, identity and/or cultural issues and concerns to consider? Does it change your view of something? Evaluate the photographers work in terms of its’ effectiveness in communicating the intended idea and meaning, including the conceptual framework of the photographs and the visual language used (use of aesthetic considerations as well as level of technical execution and/or presentation). It is important to develop persuasive support and argument for your critical judgments. Realism – to accurately portray the thing itself that affirms a means of discovery and proposing new ways to see the world. Expressionism – individuality of the artist to portray the intensity of their feelings, experience and/or emotions. Formalism – upholds the importance of formal considerations and not the judgment of narrative content, psychological associations or the imitation of objects. Instrumentalism – art is in the service of causes that reflects social content and insists that art is subservient to, rather than independent of, social concerns. Does the photographers’ aesthetic considerations, presentation and technical execution support the intended meaning? If the work seeks to inform and influence social awareness and change, is it effective? Does it unwittingly or intentionally cause social harm? Is this a good use of photography to communicate the intended meaning? How does the photographers work compare and/or contrast with similar images in other media? What do others have to say about the photographer’s work in general? Summarize your overall critical inquiry and examination of the photographers work, including what lasting impression(s) the photographer has made. List all materials referenced in the critical inquiry | analysis, including websites, books and articles used. Include a photocopy of the photographers work and/or website link. The critical inquiry | analysis is required to be submitted, either typed or online, by the due date listed on the course calendar.